The discovery of a Gustav Klimt painting that has not been exhibited for years belongs to the realm of art-historian dreams. The idea that such a work could be part of a private Czech collection sounds like pure fantasy. But this is the case of the painting Lady with a Muff, which can be seen as of June in the permanent exhibition of the National Gallery at the Trade Fair Palace. Gustav Klimt painted Lady with a Muff during World War I, between 1916 and 1917. At that time he was fifty-four and a respected and commercially very successful artist. Even so, he did not come to an artistic standstill, and his painting style continued to develop. In his distinctive style, he reflected on the lessons learned from Fauvism as well as on works by his successors Egon Schiele and Oskar Kokoschka, younger by a generation. One of the principal works from Klimt’s final epoch – the painter died of a heart attack in February 1918 – is the sizeable painting The Virgin from 1913, which is in the collection of the National Gallery. Exactly one hundred years ago, it was purchased at the Prague exhibition of the Deutsch-böhmischer Künstlerbund, of which Klimt was a member, by the German department of the Modern Gallery, the predecessor of today’s National Gallery. The Gallery, a foundation to support Czech and German arts established by Emperor Franz Joseph I, paid the then exorbitant sum of 20,000 Austro-Hungarian krone for the painting then. Just for a comparison: the Civil Service Act of 1914 determines the starting salary of a judicial trainee at 1,000 krone per year. Whether Lady with a Muff is a portrait of a particular lady or rather a symbolic depiction of enigmatic female beauty is not known. We find examples of both approaches in Klimt’s work. The painting was exhibited at a commemorative exhibition held in honour of the painter by the Vienna Secession in 1926, but since then it has not been displayed in public. It has allegedly been in the possession of the family that loaned it since the early 1930s. It is mentioned in a list of Klimt works from 1967 and was allegedly reproduced in colour in one of the painter’s monographs from the 1980s. According to curator Olga Uhrová, the painting was expertly conserved in the 1970s, otherwise there were no other interventions, and it is in stable condition. The gallery employees cannot say anything more on the work for the time being. Not even four weeks elapsed between the first contact made by the owners, who themselves offered to loan the painting to the National Gallery, and the painting being exhibited in the permanent exhibition next to the artist’s paintings The Virgin and Schloss Kammer on Lake Attersee (1909). How much would this painting be worth if it were offered on the market? There are not many works that could be compared to Lady with a Muff. Only twenty-two Klimt paintings have been auctioned by Christie’s and Sotheby’s over the past ten years, including his early work and painting studies. During the same period of time, over fifty works by Edvard Munch and James Ensor, who have a similar position in the context of Western art at the turn of the 19th and 20th centuries as Klimt, have appeared on the market, but none of them is as popular as the French impressionists or post-impressionists. One of the reasons for the limited availability of Klimt’s work is the fact that for the majority of his career, the painter did not work for the free market. As a sought-after portraitist of the Viennese bourgeoisie, he lived from commissions. He only painted landscapes for the free market. He focused on this genre during his holiday stays in the Salzburg region and in Northern Italy, where he created five or six paintings each year. Klimt’s landscapes appear at auctions most frequently and they normally fetch around USD 30 million. The Modern Gallery acquired Schloss Kammer on Lake Attersee, which belongs to this category, in 1910 for 2,000 krone. 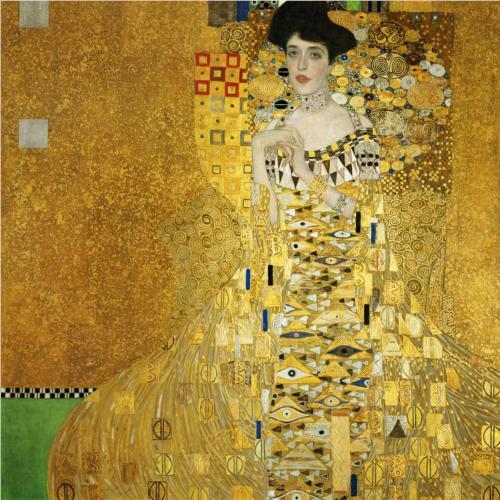 The most expensive Klimt – in this case not auctioned off, but privately sold – is the famous golden portrait of Adele Bloch-Bauer, purchased by Ronald Lauder for USD 135 million in 2006. Together with four of his other works, the painting was returned to the family in restitution by the Austrian State Gallery eight years ago after a protracted court case. The remaining works, another portrait of Adele Bloch-Bauer and three landscapes, were sold at auction at Christie’s for between USD 30 million and USD 88 million each. The auction marked the end of the dispute over the estate of Ferdinand Bloch-Bauer, a Viennese entrepreneur with a Czechoslovak passport. Klimt’s paintings were confiscated by the Nazis, but Ferdinand Bloch-Bauer himself (his wife Adele had died in 1925) fled to Switzerland from Czechoslovakia. He died several months after the end of World War II and bequeathed his entire estate (among other things, he was the owner of the chateau in Panenské Břežany near Prague before the war) to his brother’s children. Three years later, one of the three heirs signed an agreement with the Austrian government by which he gave up five Klimt paintings in exchange for permission to export other works from his uncle’s collection. The last of the heirs, the 84-year-old Maria Altmann, filed a suit against Austria with a court in California in 2000, claiming this agreement had been coerced. After six years of litigation, Austria eventually accepted Mrs. Altmann’s claim and released the paintings. The state had the opportunity to buy all five paintings for 70 million euros, but did not do so. The required price corresponded to the yearly budget of all Austrian museums combined. The total price for which the paintings were sold in the end was more than three times higher. 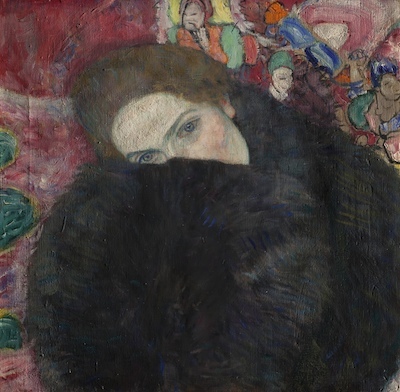 From among Klimt’s paintings that have appeared at auction in recent years, the unfinished portrait of Ria Munk from the period of 1917–1918 is the closest to Lady with a Muff in terms of motif and date. It was sold four years ago at Christie’s in London for 18.8 million pounds, which is approximately CZK 590 million. The painting on loan to the National Gallery in Prague is significantly smaller, but even so, one could expect its starting price at an auction in London or New York of around USD 10 million (CZK 200 million). If the Czech state wanted to buy it, this would swallow practically the entire annual contribution by the Ministry of Culture towards the operations of the National Gallery.